Flow cytometric analysis of live human peripheral blood mononuclear cells using HLA-DR (L243) Mouse mAb (redFluor™ 710 Conjugate) (solid line) compared to concentration-matched Mouse Isotype Control (redFluor™ 710 Conjugate) (dashed line). HLA-DR (L243) Mouse mAb (redFluor™ 710 Conjugate) recognizes endogenous levels of total HLA-DR proteins. This antibody is specific to an epitope on the alpha subunit of the heterodimeric HLA-DR protein and binds a different epitope than the LN3 antibody clone. It does not cross-react with HLA-DP or HLA-DQ. 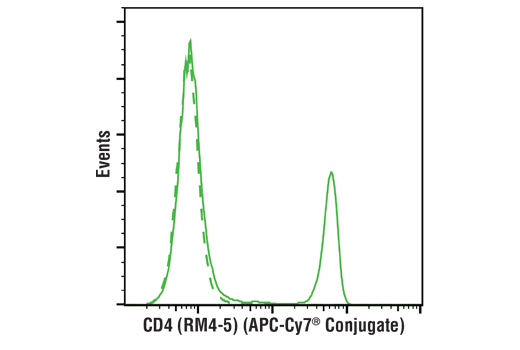 This Cell Signaling Technology antibody is conjugated to redFluor™ 710 and tested in-house for direct flow cytometric analysis in human cells. The human leukocyte antigen (HLA) system is a gene complex encoding the major histocompatibility complex (MHC) proteins in humans. These cell surface proteins are responsible for the regulation of antigen-specific immunity in humans. HLA genes are highly polymorphic, allowing them to fine-tune the adaptive immune response. HLAs corresponding to MHC class I (HLA-A, B, and C) present small peptide antigens from inside the cell, approximately 8 to 10 amino acids in length, to CD8+ T lymphocytes in order to activate a cytotoxic T cell response. HLAs corresponding to MHC class II (HLA-DP, DM, DO, DQ, and DR) present antigens from outside of the cell, approximately 15 to 24 residues in length, to CD4+ T-helper cells, which in turn secrete cytokines and stimulate B cells to produce antibodies to that specific antigen. HLAs corresponding to MHC class III encode components of the complement system (1,2). The L243 antibody reacts with a member of the human MHC Class II antigens, HLA-DR. The HLA-DR antigen is expressed on B lymphocytes, activated T lymphocytes, activated NK cells, monocytes, macrophages, other antigen presenting cells, and progenitor cells (3). Marsh, S.G. et al. (2005) Hum Immunol 66, 571-636. Shiina, T. et al. (2004) Tissue Antigens 64, 631-49. Moro, M. et al. (2005) BMC Immunol 6, 24.
redFluor is a registered trademark of Tonbo Biosciences.